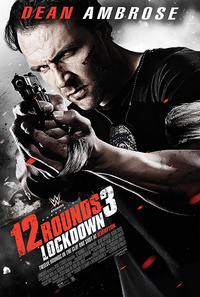 12 Rounds 3: Lockdown (also known as 12 Rounds 3 or 12 Rounds: Lockdown) is a 2015 American action film starring Dean Ambrose in his first American film debut and directed by Stephen Reynolds. It is the sequel to the 2013 film 12 Rounds 2: Reloaded starring Randy Orton and directed by Roel Rein. It is the third installment in the 12 Rounds trilogy and the second of six films, titled the 'Action Six-Pack' series, to be co-produced by WWE Studios and Lionsgate, who distribute the film. It is the first film in the series not to be released by 20th Century Fox, and was released in select theaters across the United States, and on demand on September 11, 2015. This webpage uses material from the Wikipedia article "12_Rounds_3%3A_Lockdown" and is licensed under the GNU Free Documentation License. Reality TV World is not responsible for any errors or omissions the Wikipedia article may contain.